During a polarized and bewildering election season, Jane Addams Hull-House Museum will facilitate Aram Han Sifuentes’ collaboration with artists, radical thinkers, and organizations to create her insurgent project Official Unofficial Voting Station: Voting for all who legally can’t. From September 8 through election day on November 8, the discontented and disenfranchised can cast unsanctioned ballots at JAHHM and other Official Unofficial Voting Stations across the country and in Mexico. Click the link below to find out about upcoming events. As a legal alien of the United States who is barred from voting, Aram Han Sifuentes’ Official Unofficial Voting Stations inserts an unsanctioned voting process into this year’s election season. This project is an objection to the exclusion of herself and others from central democratic processes. Official Unofficial Voting Stations will be hosted by collaborators: Roberto Sifuentes (Chicago), Verónica Casado Hernández (Baltimore/DC), Lilah Thompson (Philadelphia), Mara Baldwin (Ithaca), Brandon Bullard (Detroit), and Maritea Daehlin (Oaxaca/Chiapas, Mexico). All ballots cast at these voting stations will be returned to JAHHM to be counted and will contribute to an installation at the Museum. Click the link below to learn more about Voting Stations and collaborators. As a part of the project the Museum will host the voting station VOX POP: The Disco Party designed by Sifuentes and collaborator Lise Haller Baggesen. VOX POP finds common cause with marginalized spaces, like the disco club, where a plurality of voices energizes and empowers. 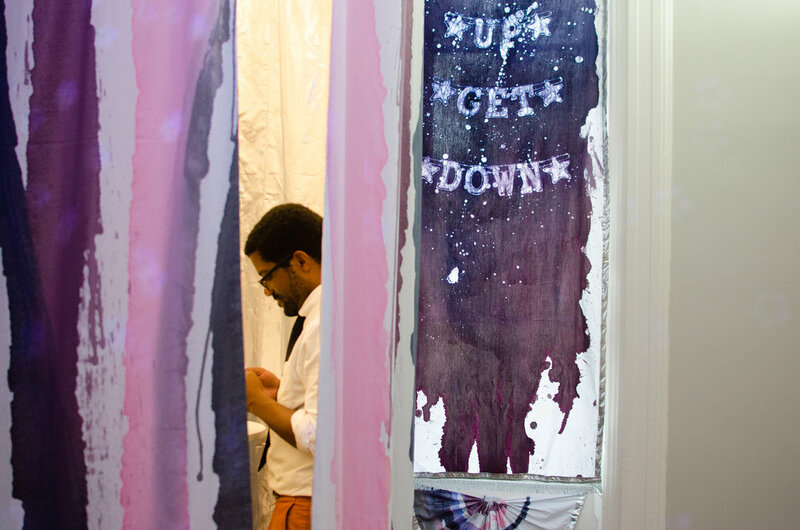 For the installation Baggesen and Sifuentes employ hand-dyed batik fabrics that twist typical American political visual vernacular. Soundscapes for the project will be provided by DJ Sadie Rock. After November 8, VOX POP will be transformed into a suggestion station where demands, questions, and critiques will be forwarded to the president-elect and Chicago Mayor Rahm Emanuel on the last day of the exhibition March 5, 2017. Aligned with the Museum and the history of the early social reformers of Hull-House, Aram Han Sifuentes’ project explores urgent questions about participation, exclusion, and citizenship in the United States. Aram Han Sifuentes was born in South Korea and immigrated to the United States with her family in 1992. She is a resident alien and the mother of a young American citizen. She is a lecturer in both the Liberal Arts and Fiber and Materials Studies departments at the School of the Art Institute of Chicago. She is a recipient of the 2017 Smithsonian Artists Fellowship and a 2016 3Arts artists award recipient. Lise Haller Baggesen left her native Denmark to study painting in the Netherlands in 1992, before relocating to the United States in 2008. In 2013, she graduated with a thesis fellowship from the Department of Visual and Critical Studies at the School of the Art Institute of Chicago. Her book, Mothernism, was published by Green Lantern Press in 2014, and since then the book and installation by the same name has toured museums, universities, and art spaces in Europe and North America. She has been a resident alien since 2014 and a mother of two young American non-citizen immigrants. Sadie Woods received a Visual Arts Certificate from the University of Chicago Graham School and recently completed her MFA in Sound at the School of the Art Institute of Chicago. 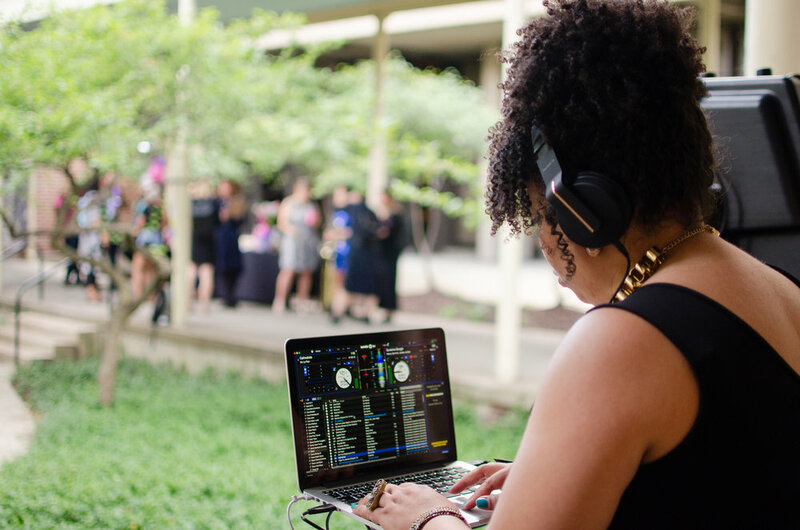 Her practice includes sound art and design, deejay performance under the moniker Sadie Rock, exhibition making, and collaborations within communities of difference.